A two-sided fireplace with a stone surround offers a rustic look in the great room. It was the desire to have a front porch that sealed Zita Billmann’s decision to build a custom home. Billmann, a real estate agent, searched for five years to find everything she wanted in a home, and while she found elements here and there, building a custom home was the right decision for her and her family. “You can change any house to your style on the inside, but we had a hard time finding the features we wanted, so we decided that building was our best option,” she says. Besides the front porch, she wanted a four-car garage and a level driveway. But perhaps most important was an open floor plan for entertaining her large extended family on holidays and throughout the year. 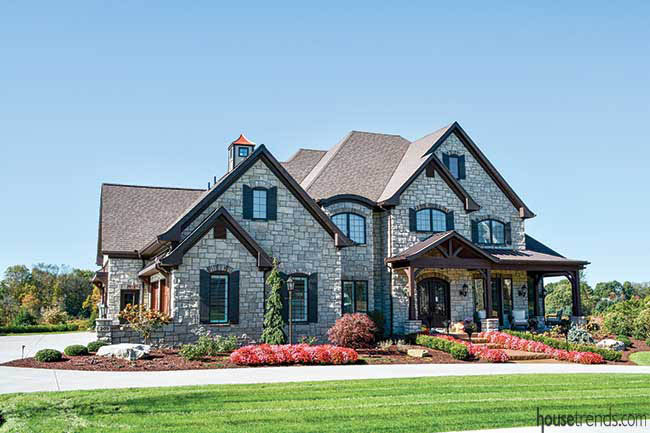 This Marshall Township home is built entirely of stone and is a stylistic blend of farmhouse and Old World European. “I wanted my storybook home to be both spacious, yet cozy and inviting, for our family,” Billmann says. She collaborated with Barrington Homes to achieve a one-of-a-kind all stone house. In addition to the sought-after porch, other eye-catching elements are the chocolate-colored stone pillars and a unique cupola over the carriage-style garage. The cupola lights up the rooftop and opens up into the master bedroom closet. The bumpouts in the front and rear give the house extra character. “The curb appeal is spectacular,” Billmann says. 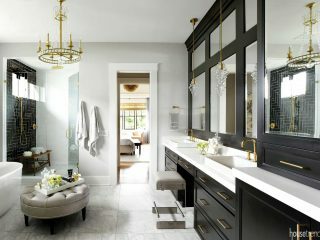 Inside, Billmann was going for an eclectic balance of rustic and elegant with a little bit of sparkle, something that felt casual but taken up a notch. Hardwood floors throughout the home add an element of warmth and sophistication. The house is flooded with natural light and is finished in neutral colors for a soothing space, allowing for decorative pops of color to showcase the personality of the homeowners. 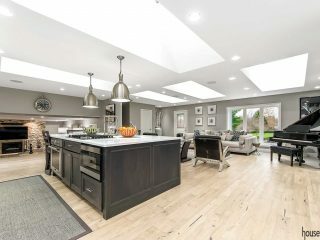 All of Billmann’s family is able to congregate in her monumental kitchen, with seating for 21 and standing room for many more, the ideal environment for conversation. The massive kitchen island, which has seating for six on three sides of it, is the focus of the space and also features functional cabinets and a microwave drawer. The island and countertops are quartzite and mostly white, save for some light veins running through them. “I wanted the countertop to be elegant and understated but with a nice style that complemented the overall look of the kitchen,” she says. She chose custom alabaster cabinets with a gray-silver inlay as an accent, which fits nicely with the gray glass subway tile. A built-in refrigerator and a coffee bar station are additional features in the kitchen. 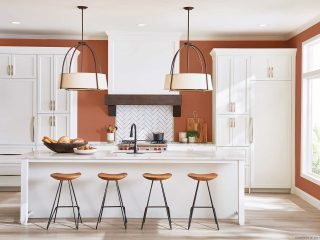 The home is bumped out to accommodate the kitchen’s main eating area, situated beneath a vaulted ceiling that boasts white wooden beams, which Heinauer says contributes to the clean, fresh look of the space. The built-in bench seat around the kitchen table, along with other chairs, accommodates 14. Natural light streams in the oversized windows, enveloping the kitchen table. In addition, elegant crystal smoky-gray chandeliers hang atop the kitchen island, while a sparkling orb chandelier regally shines down over the kitchen table. 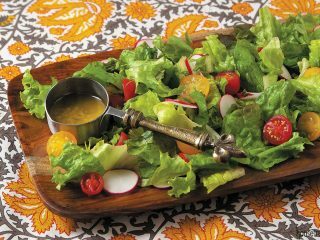 Billmann considers the kitchen among her favorite spaces in the house. “Filled with natural light during the day, upper and lower cabinet lighting creates an inviting environment to entertain in the evening,” she says. 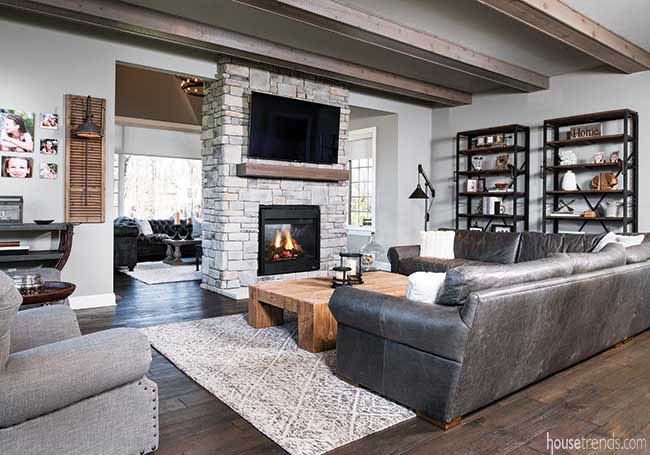 The rustic, yet elegant, feel of the home is carried into the great room, with its wooden beams, large leather sectional couch and colossal coffee table made from reclaimed barn wood. The table represents the casual, pastoral feel that complements the sophistication throughout the room and the rest of the home. The two-sided fireplace that divides the great room from the sunroom is one intentional concession that Billmann made to the open-floor concept. “The floor plan is so wide and open, it is nice to have a little separation,” she says, adding that a two-sided fireplace was a favorite feature in their former home. The stone in the fireplace is an element that carries the outdoors inside the home, adding to the relaxed atmosphere. The sunroom boasts vaulted ceilings and is filled with natural light from the surrounding windows. It is another one of her favorite rooms in the house. Like the rest of the home, the master bedroom suite is a fusion of comfortable and chic, with white and wood combining to bring about that rustic feel. The tufted bed and leather furniture with nailhead trim further helps to achieve that balance. The exquisite chandelier offsets the vaulted volume ceiling with its wood beams. A barn door custom made by Barrington leads into the master bathroom. 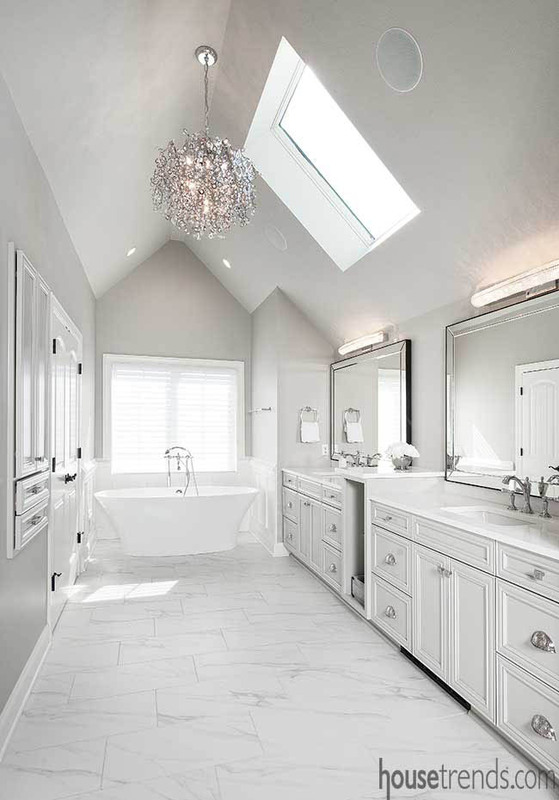 Billmann wanted a classic, clean, spa-like master bath. 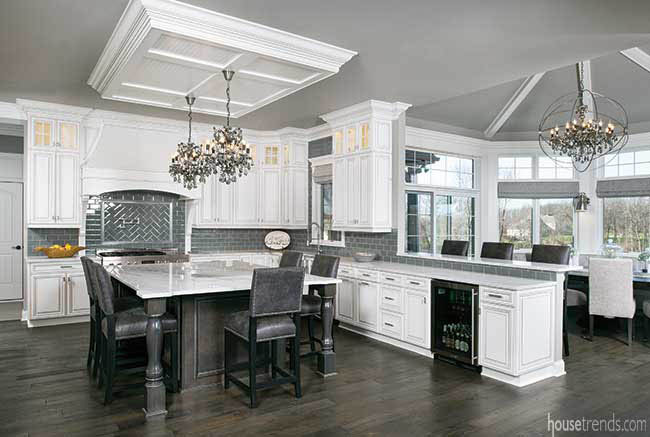 She chose white quartz for her countertops, with classic basket-weave chrome fixtures and handles. The freestanding soaking tub, with its sprayer, maintains heat for as long as the bath lasts. Like the large open spaces throughout the rest of the home, the two-showerhead shower is oversized. The skylight lends natural light to the bright space, as additional light shines through the crystal chandelier. The lower level is another entertainment destination in the Billmann household. Complete with a bar, a theater and a wine room, it is a favorite gathering spot for family and friends. Though decorative elements in the basement are in harmony with the rest of the home, the main objective was to create a space in which to relax. 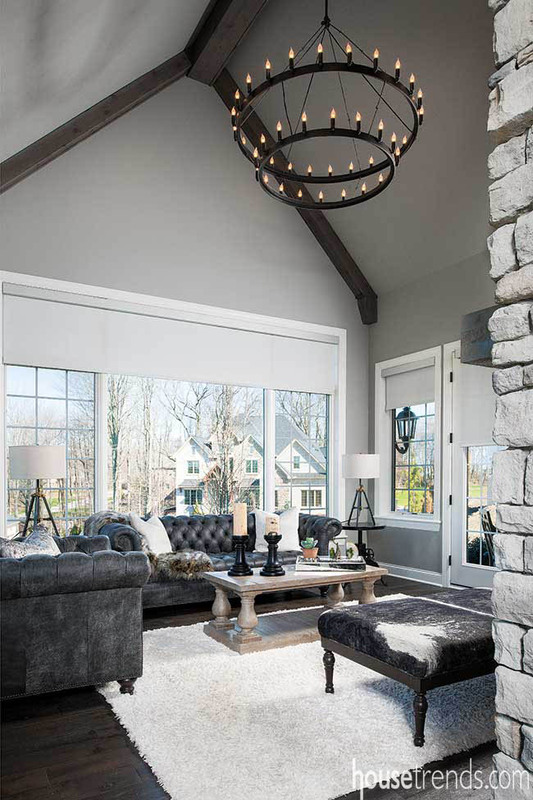 Leather chairs surround a stone bar area, calling to mind the stone façade, as well as the stone in the upstairs fireplace. The tiered theater room, decorated in neutral colors, can seat nine in comfortable leather chairs. 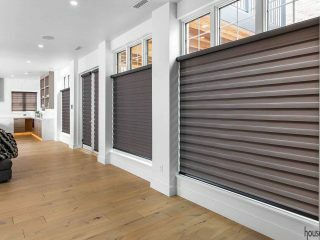 The barn doors allow the room to be open or closed. While the kids flock to the carpeted theater room to watch shows on the big screen, the adults are drawn to the wine room, which is framed by a stone arch and entered through a wooden door. 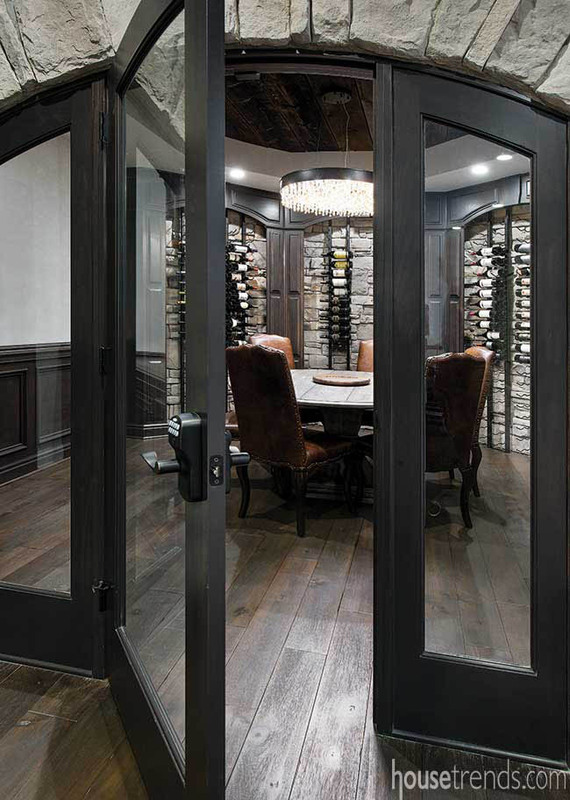 As the temperature of the room is not kept at chilly wine cellar levels, adults can comfortably gather around the game table and sip from the Billmann’s wine collection. The wine is stored in stacked stone shelves, the same stone from the family room fireplace. Billmann loves the whole house, from the front porch to the stonework to the unique cupola to the cozy yet spacious interior. 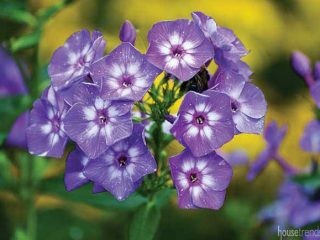 “It is a place where you want to entertain and where people feel comfortable to come over anytime,” she says. As for the stone exterior, Heinauer said Billmann might have started a trend, as he is building another one now for a client who was inspired by her home.